Health & Safety comes as standard. At Kelleher Flooring, we understand the importance of health and safety and pride ourselves on our positive and pro-active approach towards ensuring best practice in health and safety. During all of our flooring projects, the health and safety of our clients, the general public and our own staff are of prime importance – our safety record is immaculate and we routinely undertake risk assessments during all activities from the planning stage right through to contract delivery and after sales care. We have worked extensively with third party Health & Safety professionals. From Risk Assessments to COSHH, Fire Hazards to Accident Reporting, we make sure that we stay compliant with all of the relevant Health & Safety standards. We are currently working actively with Peninsula to ensure compliance and make sure that any changes to Health & Safety requirements are communicated across the company. 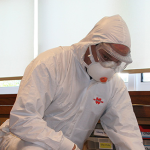 With our long track record of working in schools, hospitals and other large public buildings, we have extensive experience in removing asbestos using qualified and licensed staff / contractors. Contact us if you want a hassle-free, top quality flooring project completed on time and on budget.